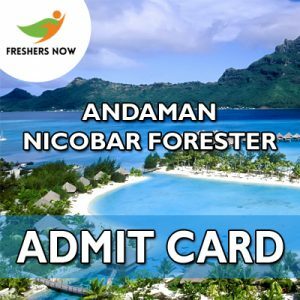 Andaman Nicobar Forester Admit Card 2019: Very good news for the aspirants that the and.nic.in Forester Admit Card 2019 is Out Now..!! The Officials of the Department of Environment & Forests Andaman and Nicobar Administration released the Hall Tickets on the Official webportal and.nic.in. Also, they have given the exact Andaman Nicobar Forester Exam Date 2019 which is on 3rd March 2019. Hence, for the sake of the aspirants, we had provided the direct download link along with the procedure useful to download the Andaman Nicobar Forester Admit Card 2019. Candidates who are ready to take the Written Exam should know the Andaman Nicobar Forester Selection Process 2019. Moreover, the detailed information is stated in this article, candidates can go through the entire page and get a clear idea about the Andaman Nicobar Forester Hall Ticket 2019. The candidates willing to attend for the Written Exam should have an idea on the Rounds of the Andaman Nicobar Forester Selection Process 2019. As per the notice declared by the higher officials, there are two rounds Written Exam followed by the Personal Interview. Also, the candidates after attending the Written exam should be prepared for the next rounds of the selection process. Recently, on 8th February 2019, a notice released by the Department of Environment & Forests Andaman and Nicobar Administration stating that the Andaman Nicobar Forester Exam Date 2019 will be on 3rd March 2019. Also, the important note was given that the Andaman Nicobar Forester Admit Card 2019 is released on the Official website namely and.nic.in only. So, the candidates can refer to this post to know the process to download or else can check the direct links given at the bottom of the page. A candidate is advised to validate all the details on their Andaman Nicobar Forester Admit Card 2019. Candidates should bring the printout of their and.nic.in Forester Admit Card 2019 in the examination hall. Similarly, Candidates should download the admit card before the date of the exam. Besides, the Candidates are advised to keep their Admit Card safe till the joining because it will be useful at the time of joining. Now, you will see the homepage on the screen. Next, check for the scrolling links showing the Andaman Nicobar Forester Recruitment. Click on it and you will see the Andaman Nicobar Forester Hall Ticket 2019 link on the screen. Click on the link and fill the details like Id and password. Finally, the Andaman Nicobar Forester Hall Ticket 2019 appears on the screen. Now, download it and make a hard copy of it for future professional use. Hence, got all the details of the and.nic.in Forester Admit Card 2019. Keep referring to our website Freshers Now for more similar details.